Back in 1956 a young Elvis Presley was booted out of West Palm Beach bar. It was one afternoon in 1956 and Elvis ambled into Dude Dodge’s Marine Show Bar for a drink. Seeing a young punk with jet-black greaser’s hair the bar keeper didn’t believe this pretty boy was 21 and so the future Rock'n'Roll king was ejected from the saloon. It’s one of many intriguing anecdotes in Bob Kealing’s new book, “Elvis Ignited: The Rise Of An Icon In Florida”. 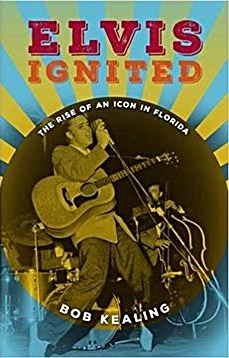 The author and longtime TV journalist connects a lot of previously unconnected dots, showing how the Sunshine State was an incubator for Presley’s breakout year of 1956. On Feb. 20, 1956, Presley performed four shows at the Palms Theatre on the corner of Clematis Street and Narcissus Avenue. It was his first headlining show in a theater, topping a country-leaning bill that included the Carter Sisters, Louvin Brothers and the Blue Moon Boys, who were Presley’s backup band: guitarist Scotty Moore and bassist Bill Black. By the way, that bartender wasn’t the only one who missed Presley’s significance in West Palm. Even with ads in the paper hyping his show, The Palm Beach Post didn’t bother to cover it, despite massive crowds of teenagers and screaming that practically drowned out Presley’s singing. Kealing cuts the paper some slack. “He played West Palm Beach as a headliner in name only,” he said. “He’s just recorded ‘Heartbreak Hotel’ but it hasn’t come out yet. He’s on the cusp of fame in West Palm Beach.” “Elvis Ignited” pulls together many fascinating strands of the Presley legend. He first saw the Atlantic Ocean in Daytona Beach. The iconic photo from his first RCA album was shot at a Florida concert. “Heartbreak Hotel” was inspired by an account of a suicide note — “I walk a lonely street” — in the Miami Herald. Presley, who made $50 at his first Florida gig, even opened shows here for a pre-TV comic named Andy Griffith. Of course, in those days, celebrities were more accessible. Anybody who wandered backstage could find a shirtless Presley willing to give a female fan a smooch or a reporter an interview. (And female reporters inevitably got a hug and a kiss, too.) Before his fame became so overwhelming, this Elvis would flirt with waitresses at truck stops or talk to fans at roadside motels. Kealing’s book deftly captures a pre-Interstate Florida where an anonymous Presley would be traveling for grueling hours down every two-laner in the state in his signature automobile. “He’s on Tamiami Trail, he’s on 441, he’s on U.S. 1, he’s driving the pink Cadillac,” said Kealing.